One of the main reasons tourists and expats alike enjoy the town of Tamarindo, in the Guanacaste province on Costa Rica’s northwestern Pacific coast, is for the abundance of international cuisine. Over 100 dining options within walking distance of downtown Tamarindo make this small beach community a foodie’s dream. It is not unusual to stroll down Tamarindo’s charming streets and hear a multitude of different languages, making it a truly international destination. So why wouldn’t the food reflect that? Foreign chefs have found new innovative ways to incorporate their homeland’s food styles with Costa Rican flavors and abundant local food. Pangas Beach Club, where the freshwater estuary meets the ocean at the north edge of town, creates an atmosphere allowing you to get lost in casual tropical elegance. Comfortable driftwood chairs and tables are set on the beach under twinkling lights, and you surrounded by the sound of the breaking surf nearby. If you are a steak lover, you can cook small slices of tenderloin at your table on the Arenal 500-degree volcanic rock. If you prefer something from the sea, any of the fresh yellowfin tuna dishes are to die for. They also have a two for one daily happy hour as they light a firepit on the beach at sunset. Seasons by Schlomy is an upscale, long-time local favorite. The Israeli chef Schlomy, who trained at the prestigious Le Cordon Blue in Paris, France, takes gastronomy to a new level. The restaurant is open air, yet intimate, set around a swimming pool inside the garden of the Arco de Iris Hotel. Here you will find a mix of French-Mediterranean food from pasta, to seafood (tuna, sea bass, snapper) to filet mignon, and vegetarian dishes. They also have specialties of the day depending on what is fresh and in-season. Located just off the beaten path, it is well worth finding. There is no shortage of Argentinians in Tamarindo. And thankfully, they have brought their style of cooking to iconic eateries, such as Patagonia Argentinian Grill. Here, the meat and steak lover rules. Cooked to perfection, you can enjoy a variety of steaks, pork, as well as the famous Argentine Milanese (their version of schnitzel). They also have seafood and vegetarian dishes for those who do not consume meat in their diets. Wildly popular, cozy, and buoyant, you will want to make reservations or be prepared to wait. Located in the center of town, there is often a street show to enjoy while you dine. Another slightly off the beaten path discovery is Dragonfly Bar & Grill. A charming and romantic space, owned by a lovely Canadian couple, Kris & Danielle, it beckons you from the road with its low lighting and soft music. Since its opening in 2005, they have been sourcing fresh local ingredients and adapting their menus seasonally. They have a full range from seafood, to steak, to curry, and salads, and they accommodate for special dietary requests, such a gluten-free or vegan. If you are in the mood for Asian food, Wok n Roll Restaurant and Oyster Bar in a bustling part of town will not disappoint. Long-time resident and owner, Kandice, has added a true touch of décor elegance—with chandeliers, animal prints, and a clean white finish to this indoor-outdoor dining treasure. No place else in the region will you find good Korean bibimbap or Vietnamese pho. Thai? Japanese? Chinese? If you have a favorite Asian country, look no further for your favorite dish. When they are in season, be sure to check out the trendy raw oyster bar upstairs. Mastermind restauranteur Frank Bucci has managed to capture the essence of Mexican street tacos at the cozy and casual Little Lucha Taqueria. Here he uses flavors and spices often not found in Costa Rica, in a variety of affordable corn tortilla tacos consisting of beef, carnitas, fish, and vegetarian delights. Multiple Mexican tequilas, beer, and soft drinks are also on offer, and it is one of the only places which offers chips and salsa on the table, just like back home. Be sure to arrive early on Taco Tuesdays though, or you may have to wait for a table. La Esquina means “The Corner” in Spanish, which is where this casual open-air, Argentinian-owned pizzeria and Italian food restaurant used to reside. Although they have moved to a location “up the hill” and not a corner, they have kept their well-known name. They offer a multitude of delicious doughy-crust pizza creations with their authentic brick oven. And if pizza is not your thing, they have a full menu of pasta and Italian specialties. El Mercadito is a sleek, teak designed, gourmet food market in the center of downtown Tamarindo, consisting of 10 restaurants, shops, a glass blower, a stage for entertainment, and a giant sailboat bar named Medusa, right in the middle of the courtyard. It is clean, inexpensive, and efficient, and patrons even receive a pager upon ordering. Options include vegan, sushi, Asian fusion, poke bowls, designer burgers, Venezuelan arepas, Argentine steak sandwiches, French pastries, and ice-creams. When you enter Bamboo Sushi Club’s downtown courtyard, it is like stepping into a secret Asian garden with spot lighting on the lush tropical plants and sounds of soothing water. Every type of fresh sushi and sashimi will tempt you, plus the daily drink specials are always innovative. For those who do not care for sushi, they also feature rice bowls. For nearly a decade, U.S. expat couple, Brian and Stephanie, who own Surf Shack Burgers & Wings have left their mark on this casual restaurant business. Located just off “the rotunda” with a view of the ocean, this family-friendly restaurant is always busy. Famous for North-American beef burgers, both visitors and locals alike can’t get enough. They also have a variety of wings, fish tacos, chicken sandwiches, vegetarian options, and decadently delicious milkshakes. Feeling adventurous? How about a peanut butter bacon shake? Plus, they offer a kid’s menu that won’t break the bank. Nogui’s Restaurant and Bar has been an institution since 1974 when Tamarindo was a small town at the end of an unpaved road, without running water, phones, or electricity. 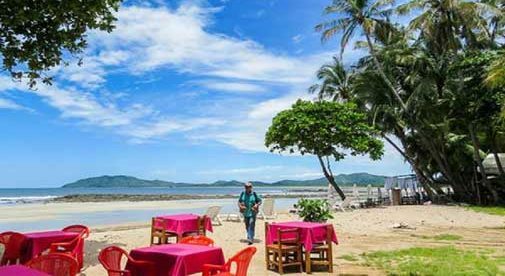 The town has grown up around it considerably, but Nogui’s continues to keep its charm with probably the best ocean view in all of Tamarindo. One can enjoy local cuisine (such as casado plates, ceviche, arroz con pollo) sitting in the large colorful chairs with your toes in the sand. Open for breakfast, lunch, and dinner (closed Wednesdays), Nogui’s is the unofficial office, meeting place, and happy hour destination in Tamarindo, even after all these years. Although considered more of a sports bar than a restaurant, Sharky’s deserves an honorable mention. This is the only place to go in town to watch the big game (any game), as they can stream matches from virtually anywhere in the world. The bar food is delicious, the service is speedy, and it is one of the few places to satisfy the late-night munchies.